Rocky Hill holds a Master's Degree in Psychology and has been a Certified Alcohol & Drug Counselor for over 20 years. Rocky began his own journey of recovery in 1980 and continues to be active in his recovery today. Rocky served seventeen years on the Board of Directors for the two local hospitals. Debbie Hill is a Registered Nurse and has over 27 years experience in both Psychiatric and Chemical Dependency nursing. 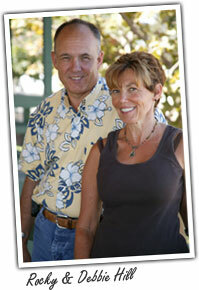 Debbie is skilled in both medical detox and dual diagnosis care. Hill Alcohol and Drug Treatments rehab center has been a clinical learning site for the RN students at Mt. San Jacinto College for many years. Debbie Hill provides instruction to the students in clinical assessment in detox and rehab, and has received recognition for her vision to adocate nurses regarding drug and alcohol addiction treatment.